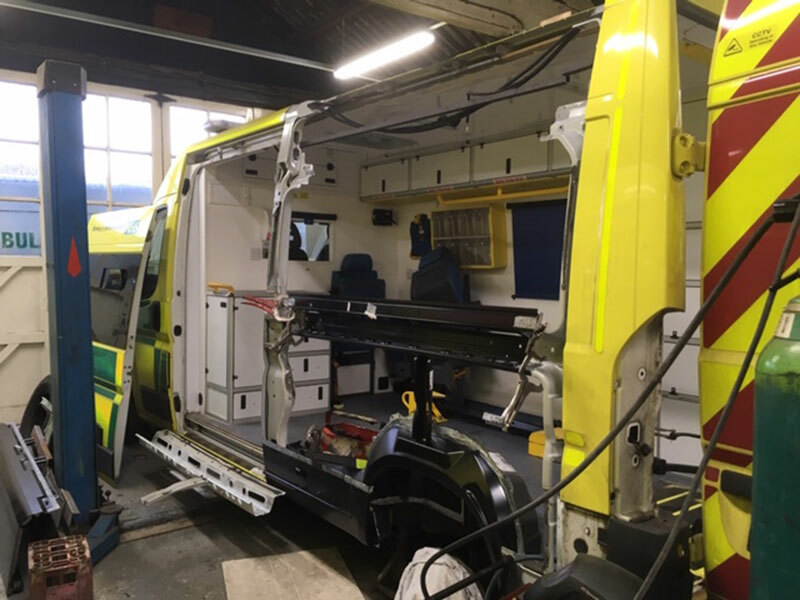 We have been providing a full range of Front Line/Blue Light Ambulance repair services to North West Ambulance Service, British Red Cross, St. Johns Ambulance and various Private Ambulance providers for many years. We are now an Approved Repairer for NHS vehicles and have undertaken specific projects for them where other suppliers have failed. We are also Approved Insurance Repairers for the NHS and have dealt with Insurance companies for many years. We understand the need for vehicles to be turned round quickly in order to reduce ‘Down Time’ therefore we endeavour to meet customer’s expectations. Our vehicle-specific knowledge and experience is extensive, having worked on Renault Master MK1 and MK2, Fiat Ducato, Peugeot, Mercedes UV Modular Body and Macneillie built Mercedes. We do occasionally get asked to provide a solution to a more unusual problem….we are more than happy to help with these and can often provide a solution better than the original! We also have the facility to produce one-off parts to overcome a specific issue but that may take a little longer!